I've pretty much been able to find any part I've needed on ebay or Bonanza...even hard-to-find, obscure parts. If they're not listed today, it seems that they will be within a couple weeks. Up until a couple years ago, there was a great old Singer shop near here. It had been in business for over 50 years & he repaired all brands.They had any part for any brand of machine that you could imagine....& a huge room full of parts machines. I'd bring tools & he'd just turn me loose in the place! He never charged over $1-$2 a part. Well, he retired & a lady nearby bought out the shop. Prices are WAY up & she didn't keep much that wasn't Singer. WOW!!! The machines that are hiding over there.... Need a "boat trip" for all of the ones I'd want!!! I don't have any tips at the moment, at least none that haven't already been mentioned...I'll have to think about this one. But, I really want to thank everyone for getting this sticky started. Great idea! I will be trying this on some feet I acquired. This web site from Schmetz needles is all about needles and very informative. 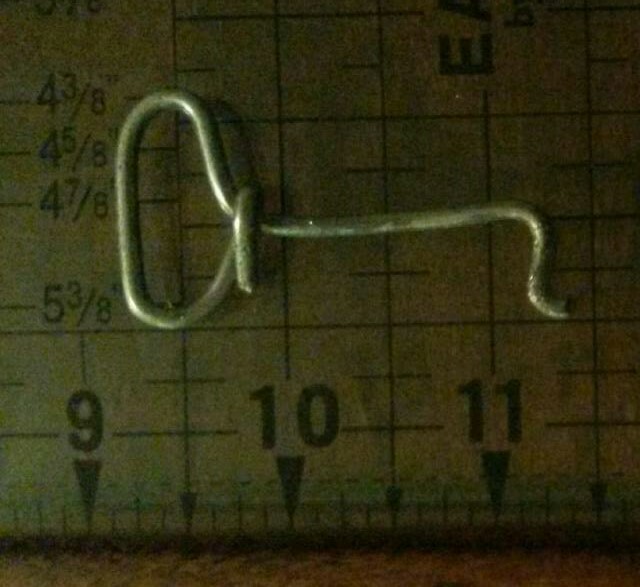 Have you ever had an OLD sewing machine case that you cannot find the barrel key for? Like a German machine? I got a great Pfaff TS convertable treadle/portable in the most beautiful case... with no key.... locked. This has worked on the two above machines and on my Frister & Rossman that I got in trade from Cathy(Mizkaki) but with no key.. The wire is not special, i just had it laying around, it is NOT spring or hard steel. I think Houdini used a key like that for his escapes. I don't believe super members can have folks banned at will. I don't believe super members can do anything that a regular member with a single post can do. Never let a sewing machine know you are in a hurry. I think what Mike was trying to tell you is that this particular thread(conversation spot) was started for people to post resources, not for general convos or asking questions. If you start a new thread by clicking the big blue button that says"start new thread"( or something like that) and asking your questions, you're sure to get whatever info someone has. You know why you were banned before and it wasn't for asking a question, as I told you, so please stop crying and lying to everyone. You said one thing in public and were threatening and extremely insulting in private. "manicmike take a breath and shut up keep your rude comments to yourself." "I will not put up with you trying to be bossy with me you are a nobody..cause oldman I will tell you to go f*** yourself"
I expect you to be banned again because you broke the rules again in starting another account after you were banned for breaking the rules on antisocial behaviour. You never accepted that you did the wrong thing or expressed any remorse. Lastly, you sent me another nasty PM where you signed it with your first alter ego. I expect also that your flooding this useful thread with your poison should be removed: You are also preventing others from finding vintage resources. Do you not consider the consequences of what you do on other people? I was never, ever rude. I asked you to please not ask questions on a specific machine a sticky thread. It's obvious even with a cursory read of the posts how this thing works, and I was forced to explain the obvious to you. You responded with a rant about how rude I am and what you're going to do if I don't shut up. Honestly, as they say in my country of origin "catch yourself on" (reflect on your behaviour). Link to Rodney's cam thread. Got a cam you want to share? Wow, looks like I missed something here. As far as Christopher's question about super members goes. You get to be one by talking a lot. It comes with the benefits of talking a lot and not much more. We're not granted super powers with the title. I talk a lot but am nowhere near being an expert on any of these machines. I just enjoy being here where I can share and learn. Forums like this are only as good as the people on them. Fortunately there are a lot of good people here. Thanks for the link Mike. I'm hoping that thread will grow into something useful for us all. corner.. me to not trying to plug a business just give leads to info.. I acquired a Viking 6020 that is all ready to go.... I know quilting will be very difficult without the extension table, but I've looked everywhere on the internet and can't find one. It has to be specific to the 6020. Any ideas on where else to look? Any help will be so very greatly appreciated!! Mindemoye - Welcome! Have you tried any of the companies that make the extension tables? Sew Steady and Sewing Mates' AdjusTable come to mind. I finally got to take my Featherweight 221 to a class and 'use' it for more than testing. What a kitten--she sure purrs nice. Since I owned all the fancy machines before buying this one treasured relic I am really surprised at how nice this one sews. Now I can sew before the household is awake! Mindymoye--I read somewhere and seen the photos of one made of wood then painted and waxed with a hard wax. Owner claimed it worked great. I am sure it would be worth trying if you could, or get someone to make you one. I have a friend whose husband cuts them from 1/4 inch plexiglass for her. Nice if you can get it. There's nothing like the stitch that a straight stitch only machine will give you. It's simple physics and usually the beginning of vintage sewing machine addiction. Hello. I am looking for information on a Singer SN AC367414. Can't find it on the list. Can't find it on the list. Serial numbers for Singers were linked in the first post. Last edited by manicmike; 03-12-2015 at 12:52 PM. I am looking for the back piece that holds the tread spools, for a vintage Viking 5000 series model # 15430. I would appreciate it if anyone knows where I can get it. Thank you. For all you people out east this museum looks like it may be very interesting when it opens.